In school, I always dreaded group assignments – the final product was never what I hoped it would be and it took twice as long to complete as it should have. My group members rarely shared the same agenda, disagreeing about our thesis, our process, and our goals. We also usually struggled to communicate with each other effectively. I know the point was to learn how to work through those challenges, because we’ll be doing group work for the rest of our lives, but it never felt like we achieved that. If only we had had more effective collaboration strategies! Older and wiser now, I see great power in collaborative efforts, but I also know there are many kinds of collaboration, and some are more effective than others. One strategy that has received significant attention in recent years, and that we have written extensively about, is Collective Impact. It’s defined by five key components: a common agenda, shared measurement, mutually reinforcing activities, continuous communication, and a strong backbone structure. I get to see this strategy at work every day through the Colorado Network of Health Alliances, a group who exemplifies the great potential of collaboration. 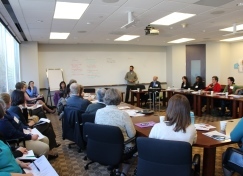 CCMU has convened the Colorado Network of Health Alliances since mid-2012. The Network is made up of 28 health alliances representing communities across the state who are effectively collaborating at the local level to make positive change in their health systems. Today we are excited to share our annual report on the Network and its members’ accomplishments: Progress & Possibilities. First, build collaboration. Though the process may be slow and time-consuming, alliances recognize that they must dedicate themselves to establishing strong relationships and a commitment to working together. They have successfully convened stakeholders in their communities who are working on the same issue in the same place, but in different ways, into one collective effort. As backbone entities, the alliances have opened lines of communication, built trust, and created common agendas between key players in the health system. Next, take action. Once a strong foundation of collaboration is built, alliances begin to tackle issues in their health system more effectively and with accelerated progress. They can also more quickly adapt and develop new strategies when new community issues arise. The Network continues to be an opportunity to share best practices and lessons learned between alliances across the state, increasing their capacity for effective action. Finally, make an impact. As a result of each alliance’s dedication to collaborative action, their impact in the community is significant. Beyond the specific outcomes of their programs, they affect broad changes in the community, which reflect their goals. Local influencers that may not be involved in the alliance’s work, such as funders, may shift their priorities to better align with the local alliance’s mission. These systemic changes are further evidence of the impact of their efforts. We have been so impressed by the achievements of the alliances over the past year, and are excited that the Network has continued to be a collective, statewide voice about local issues. We encourage you to read the Progress & Possibilities report and learn more. And, even if you were an anti-group work crusader in high school, now’s the time to introduce collaborative strategies into your own work!